Long term capital gains are taxed only when the asset is sold and at roughly half the rate on wages and salaries. Dare to suggest that the rate on investment profits could be raised a bit—so that perhaps the rate on labor income could lowered—and you’re liable to be reprimanded for failing to understand something as plain as the nose on your face: To tax capital income is to tax the reward for saving and thus to discourage saving. Less saving means less investment and less investment means slower growth, fewer jobs, and lower wages. Everyone, that is, except the people who study the issue. 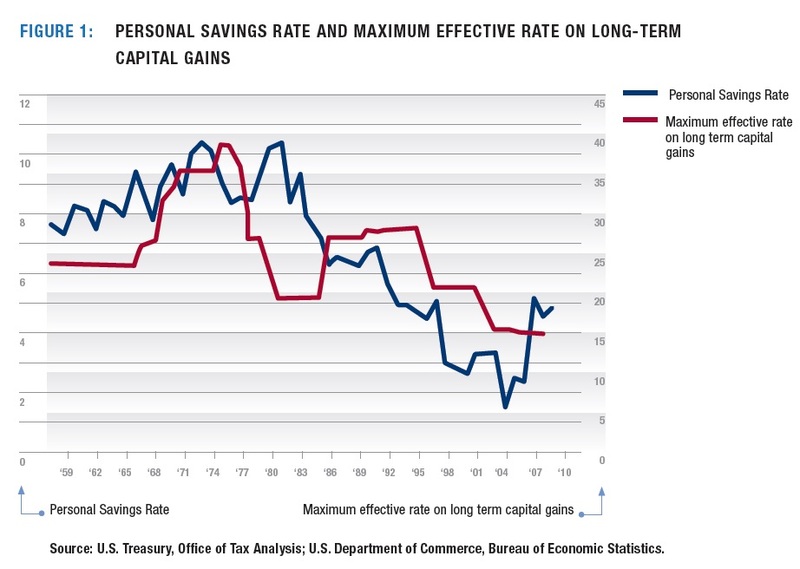 Figure 1 shows the sixty-year time pattern of the personal savings rate (the fraction of after-tax personal income not consumed) and the highest marginal effective tax rate on capital gains (accounting for deduction phase-outs, etc.). The graph reveals little discernible relationship between such tax rates and savings. 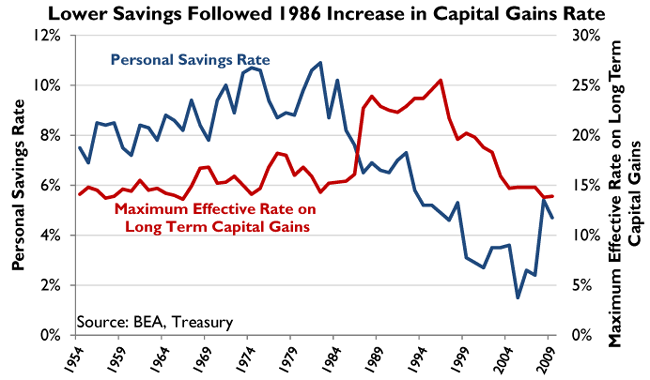 Notice in particular that the personal savings rate appears to move with, not against, the capital gains rate until the mid 1980’s and from the mid-1990’s until the mid-2000’s. But even if one could support the claim that capital income taxes—considered in isolation—hinder growth, that would not be enough. Capital income taxes aren’t set in a vacuum. Lower capital income taxes mean higher labor income taxes or additional government borrowing. (Yes, capital income tax reductions could be offset with spending cuts. But that just begs the question of why such cuts aren’t instead being used to reduce labor income taxes or borrowing .) Thus, to make the case against capital income taxes, one has to argue not just that such taxes hinder growth, but that they hinder growth more than labor income taxes and government borrowing. I wouldn’t say it is easy, but it does involve a balanced review of the academic literature, which I did here and here. The preponderance of evidence points to corporate taxes being the most harmful to economic growth, followed by personal income taxes, consumption taxes, and property taxes. Notice a pattern? The corporate tax is the largest tax on capital income in most countries, while the personal income tax is the largest tax on labor although it also taxes capital. Taxes on pure labor, like the payroll tax, do not have as big an impact as taxes on capital. The studies typically are not able to measure the effects of shareholder taxes, which are also taxes on capital, precisely because these are minor or nonexistent taxes in most countries and the data is lacking. Further, the studies indicate that taxes on income and profit are worse for growth than deficits. Despite relabeling concerns, taxing capital income at a permanently lower rate than labor income would result in higher average long-term prosperity, relative to an alternative that generated the same amount of tax revenue by permanently taxing capital and labor income at equal rates instead. Although they do not always agree about the precise likely effects of different tax policies, another reason why economists often give disparate advice on tax policy is because they hold differing views about choices between raising average prosperity and redistributing income. Not a single economist surveyed disagrees with that statement.